A Reluctant Foodie: You’ve Got To Pick a Pepper or Two! You’ve Got To Pick a Pepper or Two! I asked Al to guest post for me over on Delicieux and happily he agreed and it kind of turned into a little ingredients cook off! Wanting to keep it seasonal and from the garden if possible, Al suggested ‘peppers’ as he still had some beauties just turning ripe. We too had peppers a plenty although somewhat smaller and less fabulous! But the ‘Pepper-off’ was born and so here we are! Immediately my mind was racing with possibilities and I found myself lying in bed at night pondering ingredient combinations. In my usual manner, I came up with lots and narrowed it down, but still couldn’t settle on one outright favourite. So I set about a week of stuffed pepper suppers! I knew I had to try them all to make up my mind. A little oddly, eating this many peppers did not become dull. Every dish was interesting and enjoyable and reminded me just how damn delicious peppers are! In fact I am not a fan of peppers raw but roasted they are just so sweet, juicy and full of flavour that they become something else entirely. But actually, I discovered that this was something I needed to be careful of. Peppers are so powerful that they can overwhelm less robust ingredients and wash away all your well planned deliciousness. Peppers are such clever little vessels for stuffing. Upright or laying down they offer up an empty cavity just begging to be loaded up. A whole pepper is very filling when packed to the brim and makes a substantial main course. 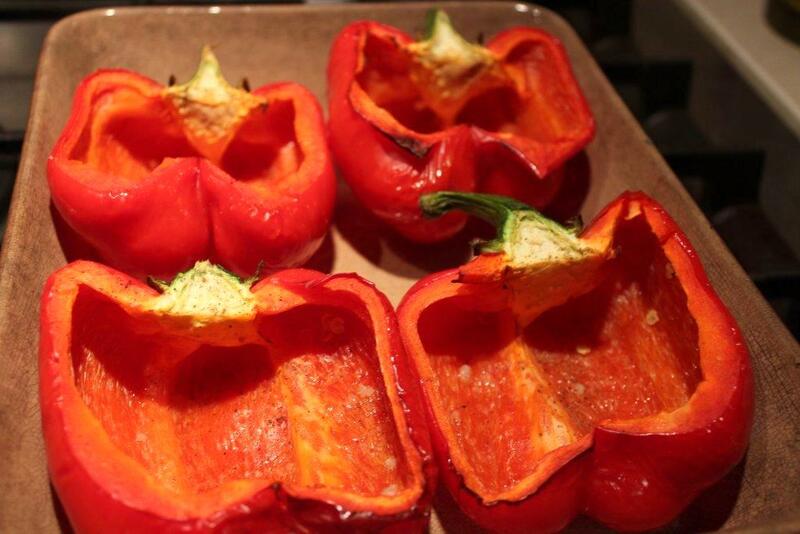 But cut in half and filled, half a pepper makes a great starter or lunch. First I shall tell you about a failure as I feel that full disclosure is a good thing in this instance. The reason for this failure of this pepper dish was because of the sum of its parts when in fact, individually everything was fantastic! This is where I learnt the valuable lesson about pepper power. 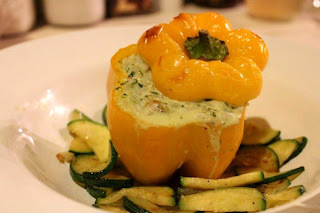 I decided to stuff a pepper with a fresh cream cheese pesto risotto. In my head this was going to be a winner. I blended my pesto, rich with garlic, pine nuts, basil and cream cheese and stirred it into my oozy soft risotto. It tasted frankly incredible. Then I stuffed it into a pepper that I had roasted a little already and popped it back in the oven, I truly expected great things. But when it came to the eating, so much of the wonderful flavour of the risotto just disappeared under the clout of the pepper! In the end, my husband and I were reduced to scooping out the risotto and eating the pepper separately. They were not lovers….. So, moving swiftly on to the successes. There were two dishes that worked really well but I only have space for one recipe. Suffice as to say, peppers stuffed with garlic lentils and tons of veggies was a delight. But I shall opt instead to tell you about Peppers Stuffed with Spiced Onions and Egg. Does that sound like a strange combo to you? Well, I thought it sounded rather nice and I was proved right! 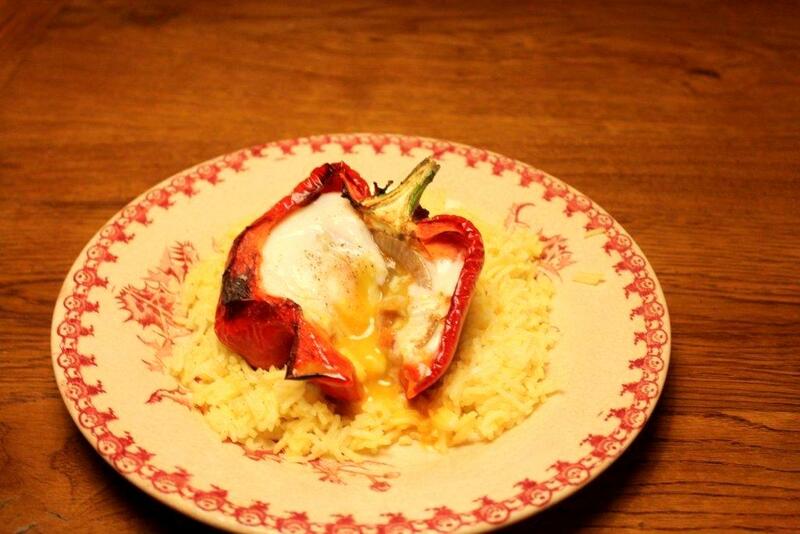 The foundation for this dish is an Indian inspired spiced onion mixture and a whole egg baked within the pepper. This for me is a nice lunchtime or brunchtime dish. The baked eggs should have lovely soft yolks still so that when eaten, the yolks spill over the onions and pepper coating all in a gooey eggy sauce. I served my peppers sitting on a little mound of turmeric spiced basmati rice. Pre-heat your oven 180Fan00C/395F. Carefully cut your peppers in half lengthways, cutting through the stem if possible. Gently remove all the seeds and white pith from within to leave a lovely clean cavity to stuff. Brush very lightly with a little olive oil all over. Place in a baking dish and bake for 20 minutes. Meanwhile, heat your remaining olive oil and fry your onions on a medium heat until softened but not coloured. Then add your chopped chilli. Whilst these are frying you can skin and de-seed your tomatoes and then chop them into smallish chunks. 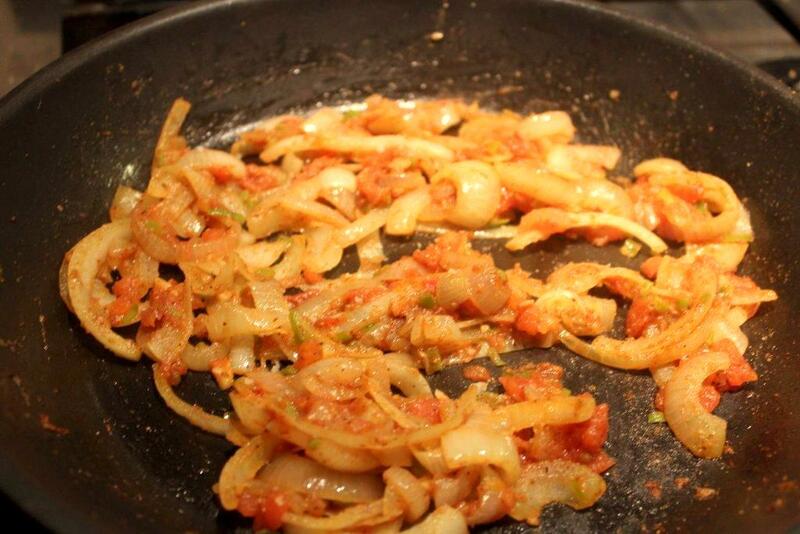 Add your tomatoes to the onions and your dry spices. 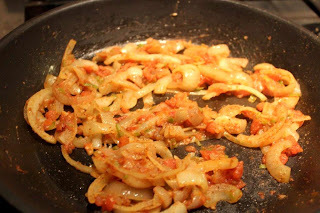 Cook this out for 5-10 minutes until the tomatoes have broken down around the onions made a thickish sauce. Season and taste and adjust your spicing if necessary. 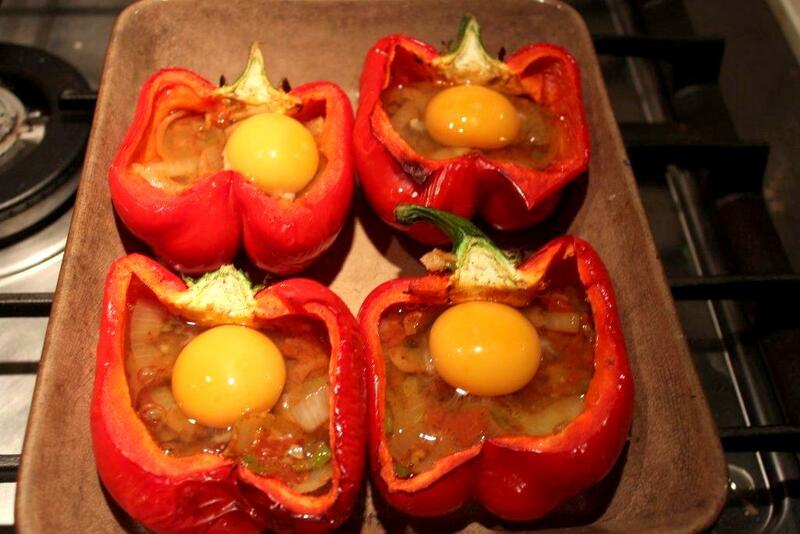 Take your peppers out of the oven and spoon a little of the onion mixture into the base of each pepper. Not too much mind – you must leave enough room for the egg. Take an egg and break it very gently, close as you can to the pepper in order to control it so that it does not slide out of the cavity. Repeat with all your peppers and eggs. 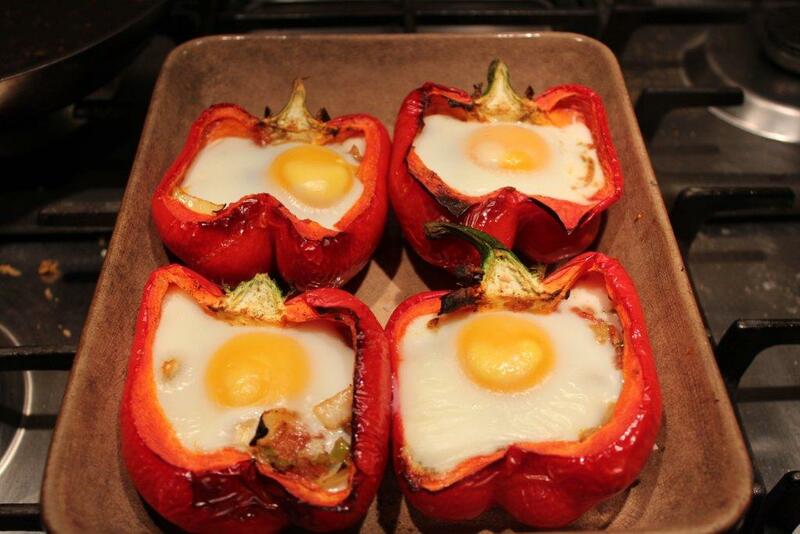 Pop them back in the oven for 8-12 minutes – keeping a close eye on them – as you want your eggs to be just cooked with a slight wobble still ensuring a runny egg yolk. 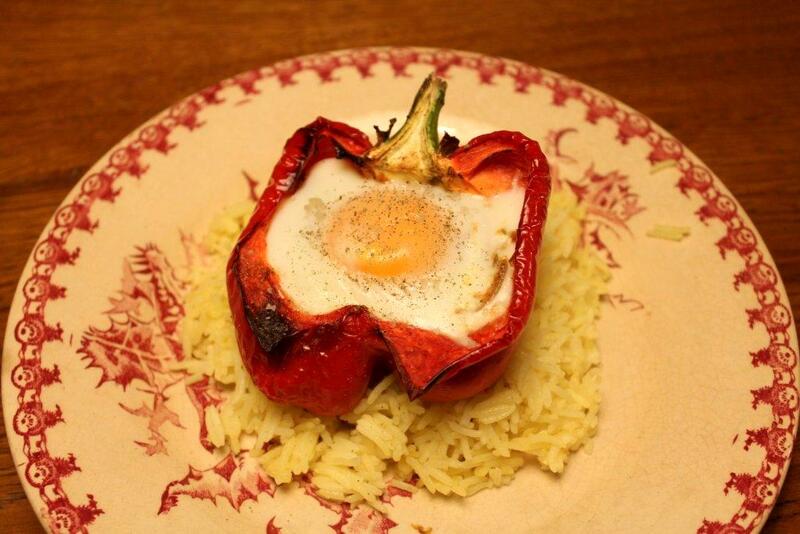 Season the eggs and serve your peppers sitting on a mound of basmati rice. Biog: I am a Private Chef living South West France. I am a 35 year old, mother of two, living the rural dream. I love to cook all food and am inspired by fresh produce and the cuisine here in France. From rustic traditional dishes to vegetarian to fine dining, I try to cook it all and share my journey with you. Stop by and check it out! This is so cool how the two of swapped stuffed pepper recipes and both sound delicious - I enjoyed reading through both posts and Anneli's fried egg version is particularly intriguing. I never would have thought to top with a fried egg... 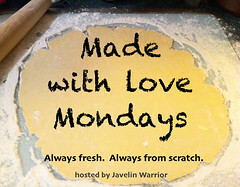 Thanks so much for sharing both recipes with Made with Love Mondays! We had a lot of fun working through the process of picking a topic, making the dishes and writing the posts. Anneli was a joy to work with. I'd definitely do it again. Works for me. You're turn to pick what gets cooked. Just let us know.